Sri Lanka's Lasith Malinga became the first bowler to take four wickets in four balls in international cricket but it was all in vain as South Africa won. 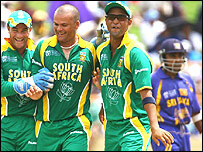 Jacques Kallis's 86 saw South Africa to a last-gasp one-wicket win in the Super 8 match at the Cricket World Cup. Set 210 to win, the Proteas looked to be cruising as Kallis built on Graeme Smith's 59 to take them to 206-5. 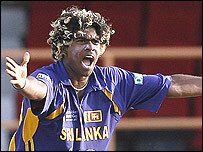 Malinga's inspired spell took Sri Lanka to the brink of victory, before Robin Peterson hit the winning runs. It was a sensational ending to the match at the new Providence Stadium as Malinga brought Sri Lanka back from the brink to give them hope with some superb full-length bowling. But his efforts proved fruitless in the end, with his opposite number Charl Langeveldt's 5-39 proving the decisive figures as Sri Lanka were skittled out for 209. The seamer struck late in the innings, just as Arnold and Dilshan were looking to open up, and ensured Sri Lanka fell 20-30 runs short of their ideal target. Their total was still more than Sri Lanka, who had won the toss, might have hoped for at one stage, though, after Langeveldt and Makhaya Ntini had reduced them to 98-5. Upul Tharanga was the first to go, edging a typical Ntini delivery, angled across the stumps, to Justin Kemp at first slip, before Sanath Jayasuriya's brief flurry of 26 from 27 balls ended when he sent a thick edge to Jacques Kallis at point off Langeveldt. Langeveldt was making his case to replace Shaun Pollock as the Proteas' new-ball bowler, and he struck again to force a leading edge off Mahela Jayawardene to AB de Villiers at mid-off. Kumar Sangakkara, ranked fourth in the world ODI rankings, briefly provided some resistance but he gloved an Andrew Hall bouncer behind for 28. And when he was followed back into the hutch by Chamara Silva (9) thanks to Herschelle Gibbs' diving run-out - which was indicative of a fabulous display in the field for South Africa - Sri Lanka looked in trouble. The Proteas did not account for Dilshan and Russel Arnold, though. Helped by Smith's decision to bowl himself and Peterson in tandem during the middle overs, the pair frustrated their opponents for over 21 overs. Dilshan finally fell in the 46th over, top edging Ntini to deep backward square, for 58 and Langeveldt returned to help clean up the tail with three wickets in a maiden 49th over. Farveez Maharoof, Chaminda Vaas and then Arnold, who made his 50 off 73 balls, all holed out in the deep, with Muralitharan the last man out, run out by Pollock's fine throw. In 44 one-day matches before this game, the two teams shared 21 wins apiece, with eight wins each on neutral ground, and another tight encounter duly ensued despite Smith's class up front for South Africa. The opener was brutal and clever in equal measure as he made a mockery of the seemingly slow pitch with a series of boundaries on both sides of the wicket, building the Proteas' recovery after AB de Villiers had been bowled in the first over by a swinging Chaminda Vaas delivery. The skipper combined brilliantly with Kallis to take the score to 95-1 before Muttiah Muralitharan (3-39) drew him out of his crease and he was stumped. Another tidy partnership was ended by the master spinner in the 33rd over when he caught Gibbs off his own bowling for a well made 33 and then trapped Mark Boucher lbw next ball. And, with spin operating at both ends, Jayasuriya had Kemp stumped by a matter of inches for five to cause some wobbles in the South Africa dressing room. But Kallis, who survived the most difficult of caught-and-bowled chances off Malinga when on 75, dug deep despite obvious cramp to steady the ship before the sensational late fireworks. Malinga (4-54) yorked Pollock (13) and had Hall caught at cover in successive balls at the end of his eighth over, and returned to clean up Kallis for his hat-trick and then Ntini next ball. It was the first time in international cricket a player had taken four wickets in four balls and all of a sudden the impossible seemed possible. But Langeveldt negotiated nine balls before Peterson, who survived another beauty from Malinga that missed his stumps by a whisker, edged the winning runs to bring relief to the Proteas line-up. Immediately after the match it was announced Charl Langeveldt had won the Man of the Match award for his five wicket haul but the International Cricket Council later apologised to the Sri Lanka management team to say there had been a communication error and Lasith Malinga should have been jointly awarded the accolade.